So why do many women feel that they are more evolved than men? 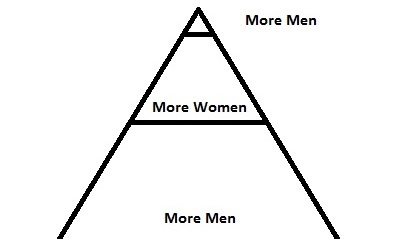 Because there is an imbalanced gender distribution in the pyramid of consciousness development. In the very top we have mostly males followed by a larger group of females, and more men than women in the bottom. 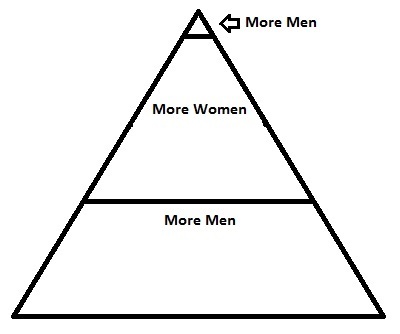 The women in the middle look up to the few men at the top (who are mostly married), while finding fewer men at their own level of development, and therefore correctly experience that they are more evolved than the men in the bottom of the pyramid. The main reason for the fewer men in the middle part is that they still need to be success oriented to make money and gain social status to be attractive to women. Men usually have to choose between having a successful career or following a path of spiritual and personal growth, while many modern and postmodern women can afford to do both. Craig Hamilton gave a great summary of this dynamic at http://integralenlightenment.com/evolutionaryman/audios/ (see last audio in the list). This is highly frustrating for women and men alike. So what is a possible solution? 1. Couples need to share in finding environmentally and socially responsible and sustainable ways to produce their family income. This will not only solve the myriad of problems that we face as a humanity, but also give men more freedom to pursue a path of spiritual and personal growth. 2. Women need to encourage, support, and guide their partners in their evolution and reward them for their progress. For these two evolutionary shifts to happen, one or both partners need to become integrally informed about their primary sexual fantasies, learned gender roles, feminine and masculine polarities, different intelligences (a.k.a. developmental lines), developmental levels (especially consciousness, spiritual, sexual and anima/animus complex), states of consciousness, personality types, and shadow work. In my own experience, I continue to be guided by women who challenge me to heal my wounds and grow in consciousness. Integral Relationships: A Manual for Men (and curious women) provides the general map for this journey. It contains many pointers to resources for a deeper understanding and practices in any one of the areas mentioned above. Women can inspire men to read Integral Relationships, or read and discuss it together with them. Partners can then develop a new vision for their relationship to heal, learn, and grow together while sharing a higher purpose that provides the greatest good for the largest number of people. The couple can then engage in an ongoing Integral Life Practice with modules for the health of body, mind, spirit/soul, shadow, ethics, sexuality, work, emotions, and relationships. Instead of shaming men and putting them down as less evolved, women can actually lift them up and guide them to a better life for both sexes and all of humanity. If you are single and want to find a partner for an Integral Relationship you may look at www.integralsingles.com. You may also consider Integral Relationship Coaching.